What started as a light out event in Australia’s Sydney in 2007, the Earth Hour has become the world’s largest grassroot movement for conservation of the environment. The world will celebrate Earth Hour for one hour on March 24 to encourage participation in fighting climate change. Earth Hour event is celebrating its 11th anniversary today. Earth Hour is inspiring millions of people to take action for planet Earth and nature. The event is coordinated by WWF and other volunteer organisations. Every year millions of people, businesses and landmarks set aside an hour to host events, switch off their lights and make noise for the Earth Hour movement. 1. Earth Hour will be observed on Saturday, March 24, from 8:30 to 9:30 pm. Landmarks all over the world will go dark and millions of people are expected to turn off their lights for one hour. 2. The global initiative coordinated by WWF (World Wide Fund) is a joint participation of 178 countries and territories all over the world. 3. Global landmarks such as the Sydney Harbour Bridge, San Francisco’s Golden Gate Bridge, the CN Tower in Toronto go dark in solidarity with the Earth Hour. 4. Union Environment Minister Harsh Vardhan made an impassioned appeal to the people to switch off all non-essential lights for an hour on Saturday to mark the Earth Hour. He said he will himself do it. 5. On the occasion of Earth Hour, the World Wide Fund India has made a strong pitch for “Give Up to Give Back” and “Connect2Earth” campaigns. 6. The campaign’s objective is to adopt a shifting of the consumption culture and behaviour change towards sustainability, helping economise operations and reduce the costs. 7. The “Give Up to Give Back” initiative to inspire organisations, institutions and individuals to make the choice to curb some habits, practices and lifestyles that burden our lives and the environment. 8. The “Give Up to Give Back” campaign includes taking steps like giving up single-use plastics, giving up fossil fuels, giving up lonely car rides for your employees, give up e-waste. 9. 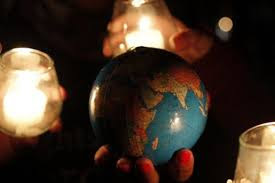 Earth Hour is also a “part and parcel” of the “Green Good Deeds” movement, in which every individual ought to take small, voluntary green actions to protect and conserve the environment and the earth. 10. Earth Hour was inspired by a demonstration in Sydney on March 31, 2007, when more than 2.2 million residents and more than 2,100 businesses switched off lights and non-essential electrical appliances for an hour.